These are the top ten 10 luxury hotels in Benidorm - based on our own personal experience and on reports from people we know and trust. The Top Ten Site has no connection with any of these hotels - we chose them purely because we like them. Tip for booking a Benidorm luxury hotel. Villaitana Wellness Golf & Business Resort. Located just inland from Benidorm, this is a true luxury spa and golf resort. There are two hotels - the Hotel Villaitana Grand, and the Hotel Villaitana. Eight restaurants - serving food for every taste. 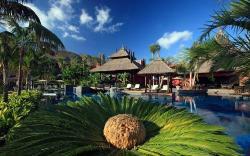 Superb swimming pools, excellent fitness facilities. Not cheap but if you can afford it - totally unbeatable! Perfect location on Levante Beach. Close to the best restaurants and bars. Sea-facing balconies get the sun all day long. room only deal and eat somewhere else. Located around 500 metres from Levante Beach. Big, modern, very luxurious. Fabulous pool complex. Great views of the local mountains. Get a room high up! bars very close by. Try The Admiral Nelson Pub. Located just inland from Benidorm. Super luxury Asian style buildings and decor. very highly regarded Thai therapy spa centre. A fabulous place to stay and relax. of hundreds of restaurants, bars and shops. Also just a five minute walk from the wonderful Old Town. suite-hotel - ie all rooms are actually suites. Terrific value - especially if you book through a reputable agency. distance - but if you get tired, several buses stop right outside!